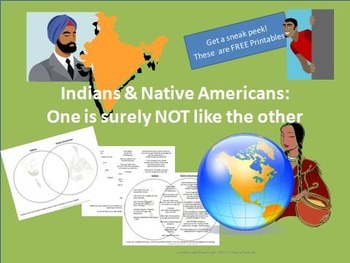 This is a FREEBIE, and explores how Indians and Native Americans are NOT the same people, even though some still choose to call Native Americans Indians. Through a venn-diagram activity, students can learn much information about how these two cultures are mostly different from each other (as well as a few surprising things that they DO have in common). Through this topic, students can learn about how they are different geographically, in religious aspects, through other countries' occupations, and more. Enjoy!